The UFC bantamweight division was flipped on its head today as TJ Dillashaw was notified of a potential USADA violation thus resulting in a one-year suspension from the New York State Athletic Commission. Because of that, the bantamweight champion relinquished his title thus making it vacant for a new champion to be decided in the next fight for the crown. Prior to the news, it made all the sense in the world that top contender, Marlon Moraes would be next in line for Dillashaw. Therefore, it still makes sense for him to now fight for the vacant title. It just comes down to who against. In Dillashaw’s last time out, he was seen trying to capture the UFC flyweight title against the champion, Henry Cejudo. However, that endeavor didn’t go all too well for Dillashaw as he would suffer defeat via 32 second TKO in round one. Which led to speculation as to whether or not we would see a Cejudo vs Dillashaw rematch at 135 pounds. Moraes’ mention of ‘Cejudoweight’ was in reference to Cejudo’s comments from earlier in the day following the news. “I’m the biggest name now. I hold all the cards. It ain’t the flyweight division or the bantamweight division it’s the Cejudoweight division. 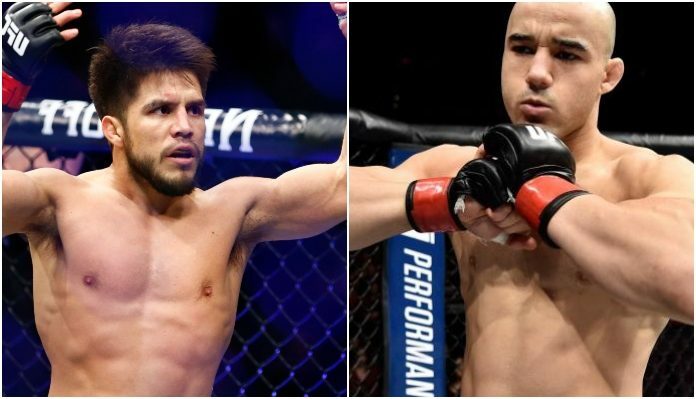 So I will just wait and see what the UFC has planned for the Cejudoweight division.” Cejudo told Helwani in wake of the UFC bantamweight title being vacated. But now after seeing Moraes’ comments on the matter, it prompted a fiery back and forth between the two potential candidates for the vacant title fight. In Moraes’ last bout, he scored a phenomenal victory over Raphael Assuncao in their rematch at UFC Fortaleza when he got the first round submission (guillotine). The win extended Moraes’ current winning streak to four straight. Three of which have come via finish (two knockouts, one submission).